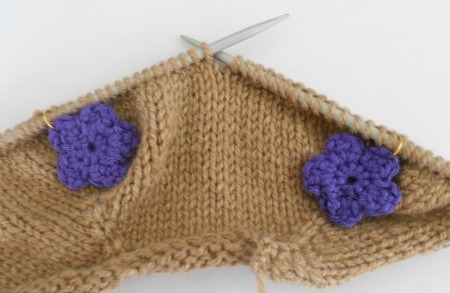 I am making my first top down cardigan and am using some cappucinno yarn which goes rather beautifully with the purple, don't you think? Never thought of putting the two together but now that I have I'm loving' it!!!! Isn't it gorgeous? I needed something light and short sleeved to wear over sleeveless summer dresses when I'm feeling a little conscious of those upper arms (anyone else get those moments?) and also something that can go with jeans on a cool spring or autumn day. I love the simplicity of the style with just a dash of 'girlie prettiness' on the front borders. Exquisite. 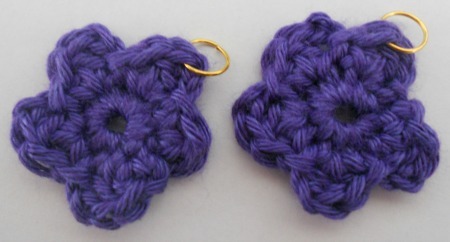 I'm off now to make meatballs for D and A but have already got another couple of ideas frothing around in my head for more stitch markers. I think I could get quite into making these little poppets out of all sorts of things, so watch this space!!! I may just enter my stitch markers into The Made It Challenge over at Woolhogs which is where you'll find Rene's version of the Summer Waves Cardi so pop over if you have time and have a look. Have you created anything beautiful recently?